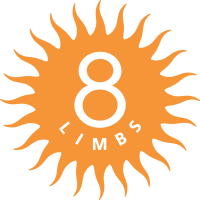 At 8 Limbs we love putting things together. We enjoy the alchemy that occurs when, for instance, students are joined with teachers, movement befriends stillness, action partners with reflection. This year, for our Many Paths Teacher Panel Series, we are exploring Yoga Math – The Alchemy of Yogic Philosophy. October 12 (date posted incorrectly in October Newsletter) kicks off an 8-month series, 2nd Sunday of each month, 6:30-8pm. Each panel will focus on a different “equation” and rotate among our four neighborhood studios. 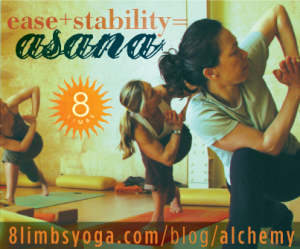 The alchemy that brought 8 Limbs into being 18 years ago this month was a careful blending of yoga and business. Nurtured by the book “Growing a Business” by Paul Hawken, this English major (me!) with a blossoming love for yoga found strength in Hawken’s words: “a good business enhances the lives of all who work within it, and enriches the lives of all those who are touched by it.” That sentence made it possible for me to envision a yoga business with integrity. Thanks to all who have worked and practiced at 8 Limbs over these last 18 years. You are 8 Limbs. And a very fond farewell to several employees who have recently moved on from 8 Limbs: longtime teachers Dawn Jansen and Jen Yaros, and our Boutique Buyer Melissa Lundsgaard who will continue to teach and lead kirtan at 8 Limbs. We welcome Martha Bailey, a veteran buyer with experience at REI and Moving Comfort, to the position. To celebrate, all drop-in yoga classes at all four studios will be $8 on Tuesday, October 14, our anniversary. Happy Birthday 8 Limbs! This letter is part of the 8 Limbs October Newsletter. Read full version or subscribe (monthly).